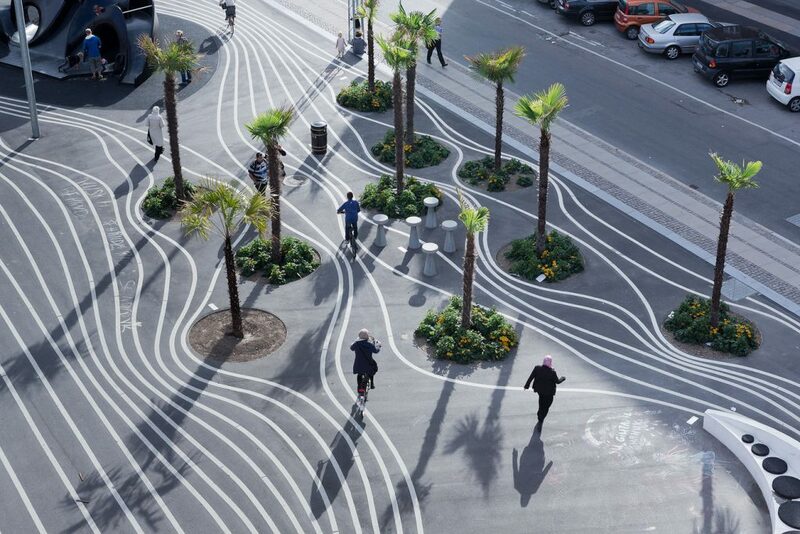 Berlin-based landscape architects TOPOTEK 1 embrace the foreign and welcome the impure. Not that this is either radical or new. According to its founding director, Martin Rein-Cano, such destabilising practices are a legacy of the garden tradition. The peculiar achievement of Martin Rein-Cano and his studio TOPOTEK 1 is to have invented the ground beneath your feet. A charged middle ground, where the landscape architect’s tactics are narrative, conflict and negotiation. There is an almost giddy, counterfactual delight in pursuing the idea of the garden as a place of conflict, but in TOPOTEK 1’s work this isn’t a frivolous endeavour. Instead, there is evidence and belief that conflict should not be ignored or resolved, but rather illuminated and sustained. Projects such as Superkilen and KAiAK (Kunst und Architektur in Alt-Köpenick) acknowledge that cities cultivate conflict and respond with spatial and aesthetic moves that keep the wounds open rather than suturing them. The KAiAK project was built in Berlin in 2007 following a competition as part of a larger project for the neglected East Berlin district of Alt-Köpenick. The neighbourhood was slated for redevelopment as a way of promoting new housing and investment in a series of vacant sites and missing fabric. Rein-Cano’s scheme was one of the temporary projects selected to launch the transformation of the district. Conversations with the local community provided three distinct needs: a space to hold markets, a play space for children and more carparking. Their first move was to excise the site from its historical context, through a charged ground plane of solid, figured colour. Two gaps in the urban fabric of the district were opportunistically annexed by painting the existing asphalt surface in red, with purple lines and white numbers marking a gridded field – a kind of board game whose instructions had long been lost. Rather than designing discrete zones in response to the community brief, the field integrates these seemingly opposed and conflicting uses into a single gesture. The functionality of the ground shifts, driven by conflict, exchange and consensus, depending on the time of day, and on the critical mass of cars versus people. Humble road paint performs a triple duty – describing parking borders, delineating market stalls and providing a playable super-graphic for children. As Rein-Cano puts it: “Tension makes the place urban. Mono-functional places are tension free”. 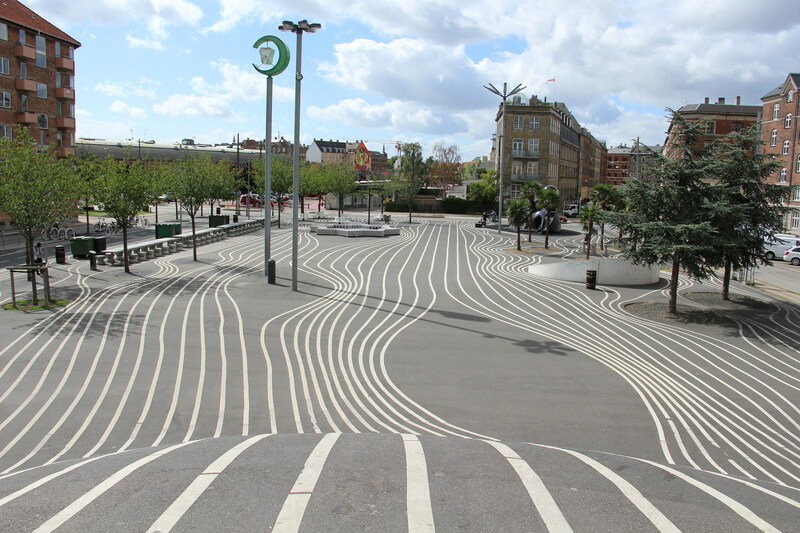 Their Superkilen project in Copenhagen is a later project, and perhaps the most explicit demonstration of their approach to the design of public space. It is located between identity and foreignness, on one hand, and between nature and artificiality, on the other. 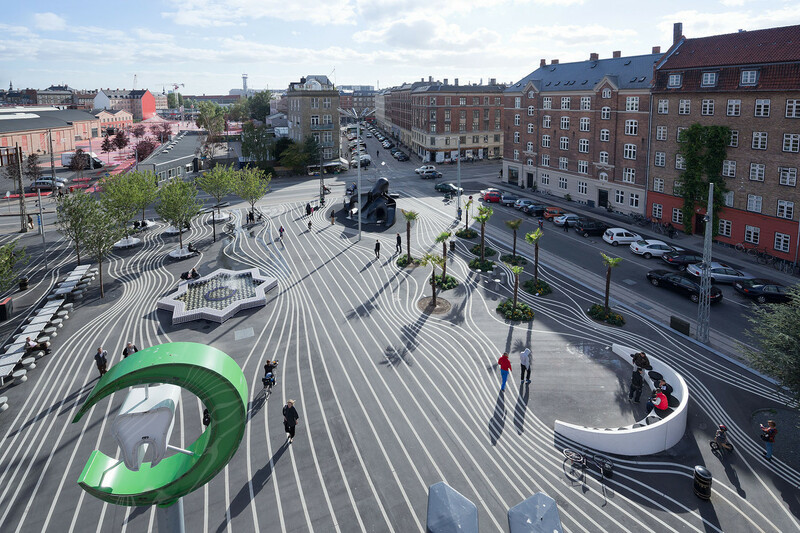 Completed in 2012, it is a 27,000-square-metre public park, designed in collaboration with the Bjarke Ingels Group and SUPERFLEX, as part of a larger urban regeneration project for the neglected Nørrebro neighbourhood. 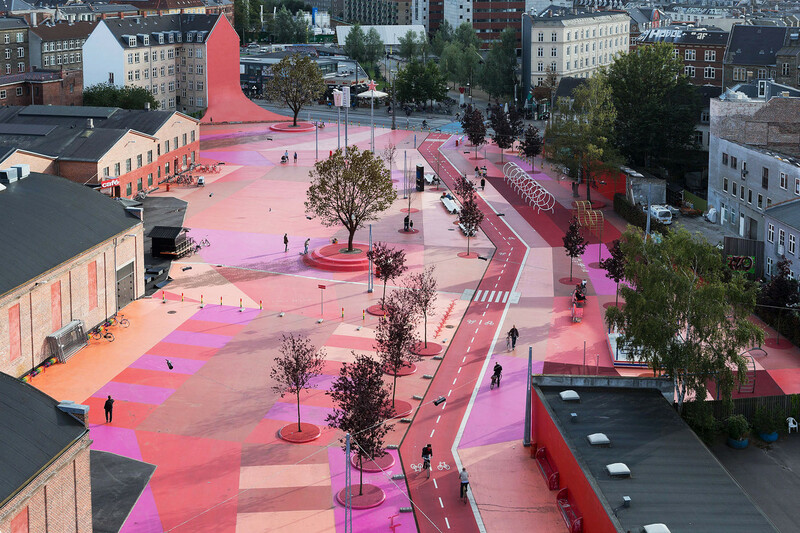 Superkilen is organised in three spatial zones coded by, and seemingly made from, solid colour. The Red Square is an active zone designed to host public events, The Black Market is an undulating plaza and meeting place and The Green Global Park a space for passive leisure and sports. 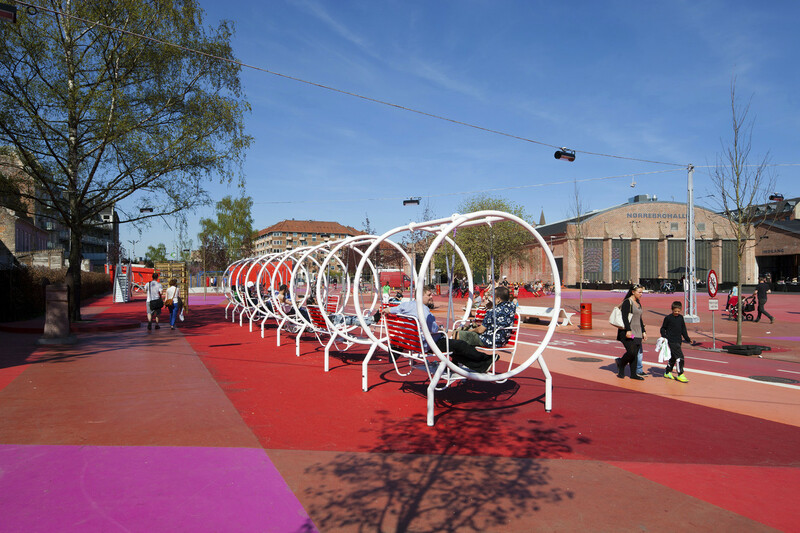 The three zones are equipped with an array of 98 imported objects: different kinds of furnishings and fragments selected in consultation with the residents of Nørrebro, which is well known as a poly-cultural neighbourhood of Copenhagen. As of 2017, one-out-of-six inhabitants had a non-Danish passport. The 98 objects are literal 1:1-scale samples of urban icons, selected by residents from their cities of origin. The project is a kind of ‘copy-paste’ park in which fragments of public spaces from all over the world have found their way to Superkilen: a Moroccan Fountain, soil from Palestine, a bus stop from Kazakhstan, a doughnut sign from the USA, a dentist sign from Qatar, a Japanese octopus play structure, a Thai boxing ring and the Spanish Osborne bull. As a meeting ground, the combination of colour field and foreign objects creates a space that is remarkably contextless. 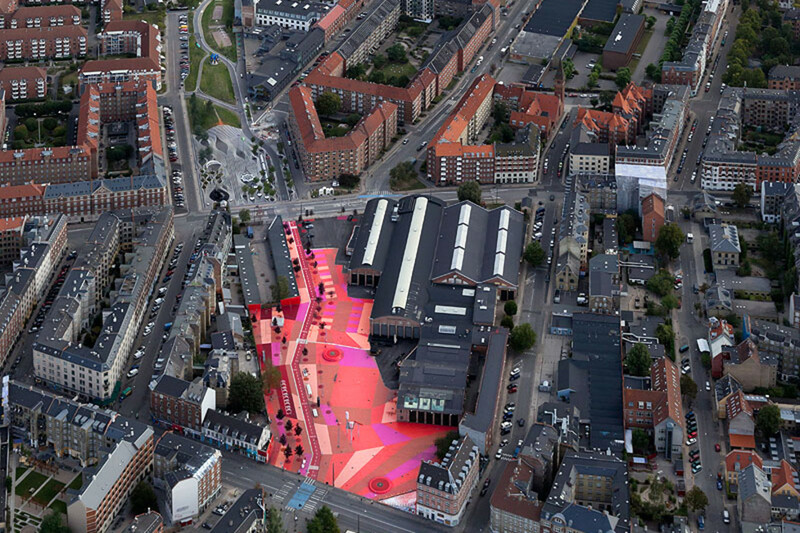 It is as if the Nørrebro district had been removed from Copenhagen and replaced with a transposition of another world. But it is a charged space, not a simple exchange. These migrated objects are made dynamic by stories rooted in the different cultural contexts of the people that live there. The uncanny middle-ground invigorates the space between them, in a manner that creates its own kind of territory. Suddenly, Copenhagen is an open city – with ambiguous boundaries to the world and new stories to tell. The work of TOPOTEK 1 shows a way of designing public space and landscape as a kind of rendition – the tactical transfer or surrender of the body, from one jurisdiction to a foreign one. 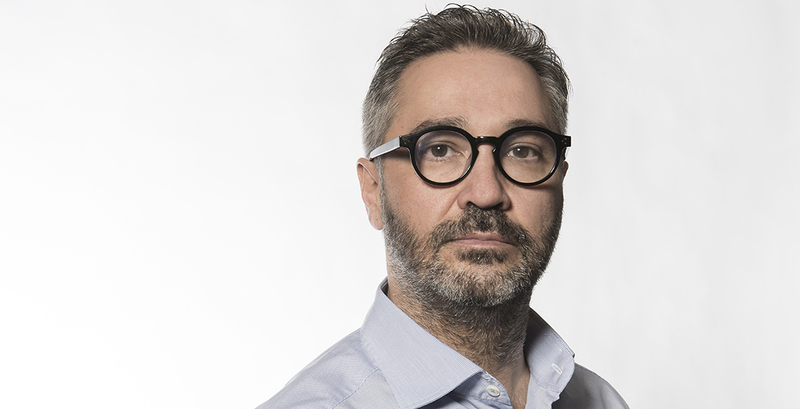 Identity, foreignness and migration are themes which Rein-Cano will expand on during his appearance at the 2018 International Festival of Landscape Architecture (11–14 October 2018, Gold Coast) as a keynote speaker and as part of the “Navigating Political Terrain” panel discussion. Mark Jacques is a director of OPENWORK, a studio for landscape architecture, urban design, research and speculation. He is Professor of Architecture (Urbanism) Industry Fellow at RMIT University’s School of Architecture and Urban Design. Quotes used, unless otherwise specified, are from Creative Infidelities. On the Landscape Architecture of TOPTEK 1, Barbara Steiner ed. Jovis Publishing 2016.